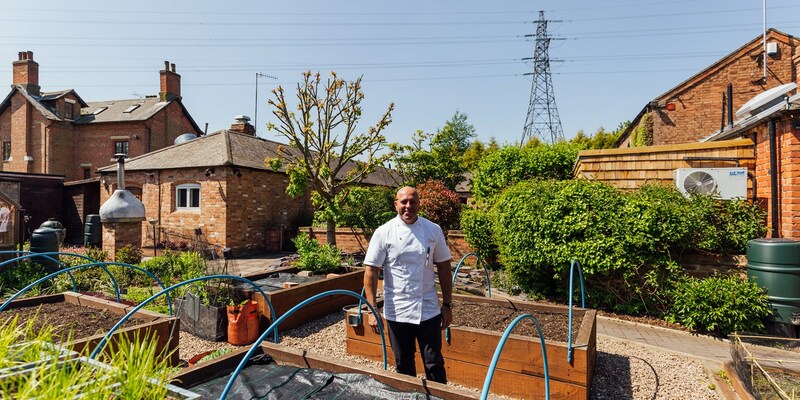 Being next to a motorway flyover on an industrial estate hasn't stopped Sat Bains from creating a little foodie paradise in the grounds of his two-Michelin-starred restaurant – complete with resident rabbits. Take a look at what he's built and how he's managed to eliminate almost all food waste with one very clever composter. There’s something a little weird when you walk around the kitchen garden at Restaurant Sat Bains. It isn’t the unusual plants; it’s not even the rabbits hopping around your feet. After a few minutes, you realise it’s the constant background noise of cars zooming across the motorway above – the last thing you expect to hear whilst in the middle of such tranquil surroundings. But it’s that contrast between an urban setting and a picture-perfect garden that Sat Bains loves so much. His restaurant is almost as famous for its unlikely location as it is for its food, and for the past eight years Sat has been gradually transforming the building’s garden from a patch of unkempt grass into a sweet shop of weird and wonderful herbs and vegetables. ‘We had a few things growing, but then we got a gardener called Ken Holland to come in and build some vertical beds on the walls and give everything a bit more structure,’ he explains. ‘After that came the greenhouses – we’ve got a growing greenhouse for herbs, and then a finishing one when they’re ready to harvest. We’ve now eliminated any transport of herbs which is great – they’re so easily damaged in transit and come packed in plastic or polystyrene, sweating away in the lorry. To be able to cut herbs to order in the kitchen is amazing. While many restaurants are now home to a kitchen garden – which can mean anything from a few herbs growing in a raised bed to something much more large-scale (chefs like Simon Rogan have their own farm) – I’ve never come across one that’s as focused on sustainability as Sat’s. Transporting produce (especially delicate ingredients like herbs) requires packaging; something the chef tries to minimise as much as possible. Food waste is a huge issue in the industry, too, but and that’s where Sat’s all-singing, all-dancing Closed Loop Organics composter comes into play. At first, it might not sound like the most interesting thing in the world, but it’s revolutionised how the kitchen works at Restaurant Sat Bains and saved the team a lot of money in the process. Being able to walk around and look at the flowers, herbs, vegetables and fruits in their natural state before they make their way to the kitchen is a bonus for any restaurant. But doing that while traffic roars in the background, knowing you’re in the middle of an industrial estate, is even better. It might be a bit unusual, but that’s what Sat wants. People come to the restaurant because the menu is something you can’t get anywhere else; it makes sense to ensure the setting is just as unique too.